This two approaches image shows the difference between the German and British Messtins. By 1916 when both of these messtins were manufactured, the British pattern (in this case Canadian manufactured) had been in use for over a century. I believe the German example is a 1915 version. Great Side-by-side comparison Ed! I'm not sure why the British insisted on covering their mess tins with covers, as far as I know, the Germans just painted them or left them unpainted. Also, The German mess tin seems to have been a popular design as it was copied by tons of European countries over the years! Notice the three-piece D-shaped mess tins going for $1.00! 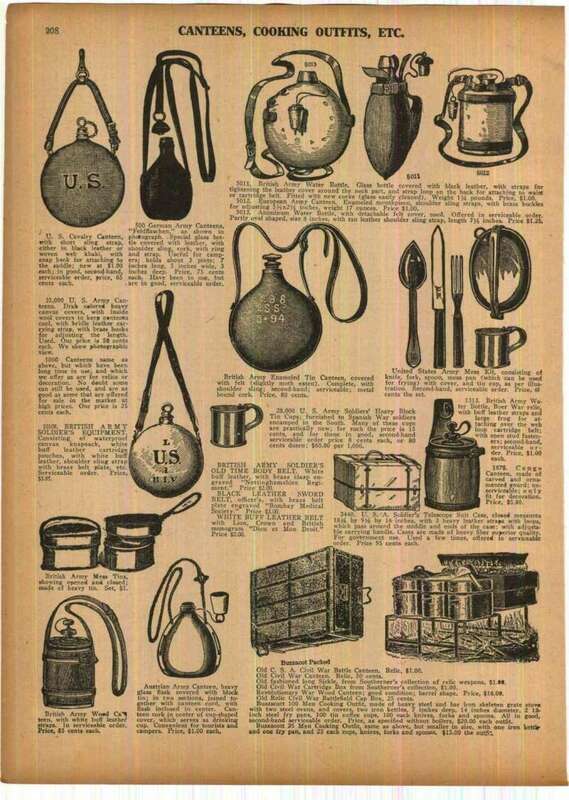 In the top right corner, you can also see a Bottle, water, enameled. (Mark V.) in a Pattern 1901 waterbottle carrier for just 0.85¢! I wonder if they were all used up as camping equipment or if they are hidden away in some forgotten warehouse today? That is a very interesting catalogue listing. Nice kit, but even at a $1.00 that was very expensive at the time considering that was the daily wage for a worker. "$1.00 in 1927 had the same buying power as $13.17 in 2014. Annual inflation over this period was 3.01%." The inflation calculator is a handy tool, but it really does not give the whole picture. Wages were lower and back in those days you could actually purchase small items for a penny. A kid with a nickel was considered to be very lucky. I checked the calculator for 1969 and compared 1.00 which is what I paid for the Airfix RAF Refueling Set back then with the price of the set today and Amazon lists it at about $13.00 which matches what the calculator gave me. The point is though that it took over two months for me to save my weekly 10 cent allowance in order to purchase that model kit where as today, 13 bucks is not a lot of money. At any militaria show, $20.00 seems to be 'the coin of the realm', and that won't get you much these days. Twenty bucks doesn't seem to go very far at the militaria shows that I have been to over the past few years either!